Hey Kardashians: Why you so obsessed with me?Another Kardashian transgression to add to the (growing) list: E! Online posted this pic of the Jenner girls with Kourtney Kardashian and Mason, taken at Mason's 2nd birthday party back in December. Looks like they were uber creative and went with a "Cowboys and Indians" theme. Wow. Adding insult to injury is the fact that E! used the headline "Cute Alert!" --I, personally, don't find racial drag "cute." If little Mason and his mama were sporting some blackface, would that be "cute"? (Answer: no. A Cowboys and Indians Party is just as bad as a Blackface Party. 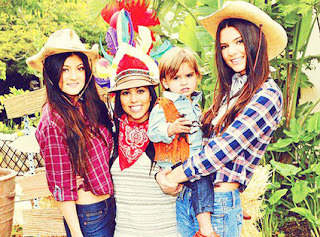 )Comment: For more on the Kardashians, see Khloe Kardashian Thinks She's Native and Khloe Kardashian in a Headdress.